So, what have we been up to lately? Actually, it’s more like where we’ve been up to. 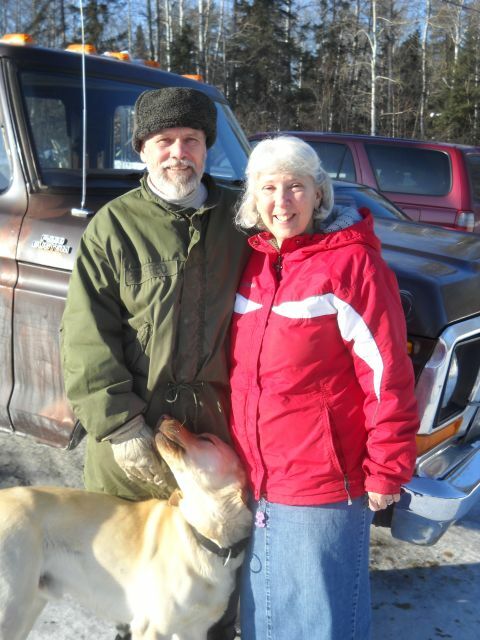 Wednesday, February 8, found us loading up the van and heading north around 7 a.m. for Pickle Lake, Ontario. 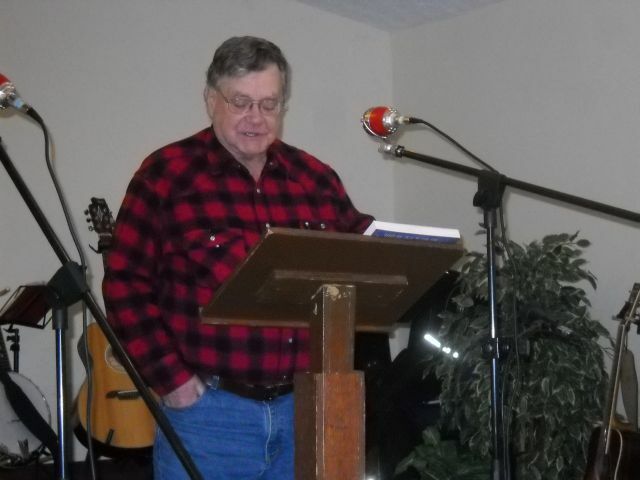 There was a Christian workers conference that weekend which we were invited to sing at and a friend of ours, Don Stolhammer, was asked to speak at. 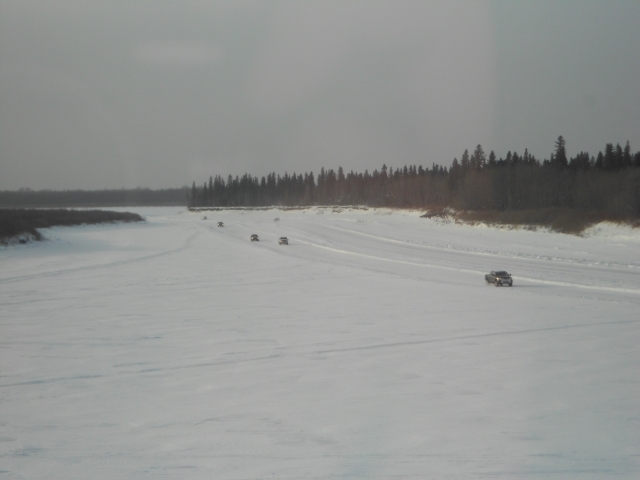 So, we rendezvoused around 7:30 and caravanned northward to Dryden, where the folks at Beaver Lake were very generous to let him leave his truck for the weekend while we carpooled on to Pickle Lake. 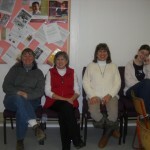 Yes, we did visit briefly with our friends before starting out again. We enjoyed reminiscing about last summer. 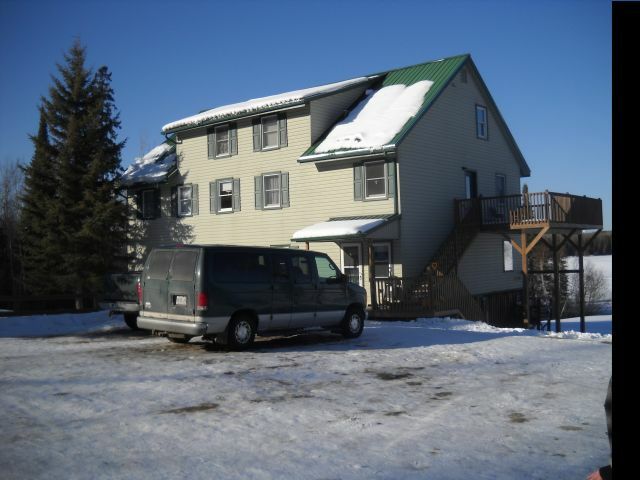 The guest house where we stayed last summer looks different with snow! 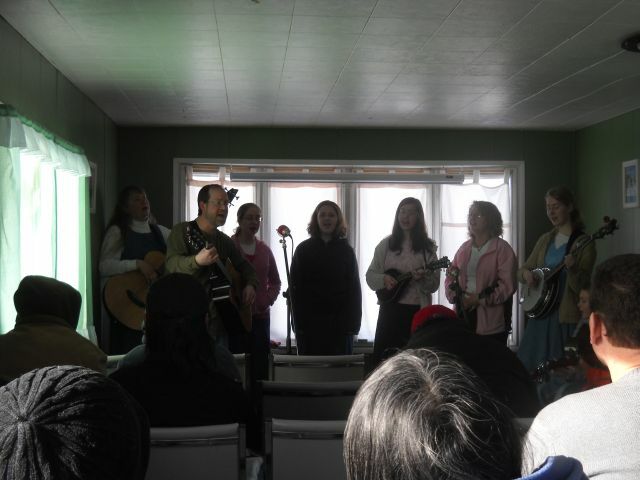 Thursday morning we sang at “The Trailer,” a ministry the Rassmussen family started. People come the trailer house for coffee/tea and some breakfast. 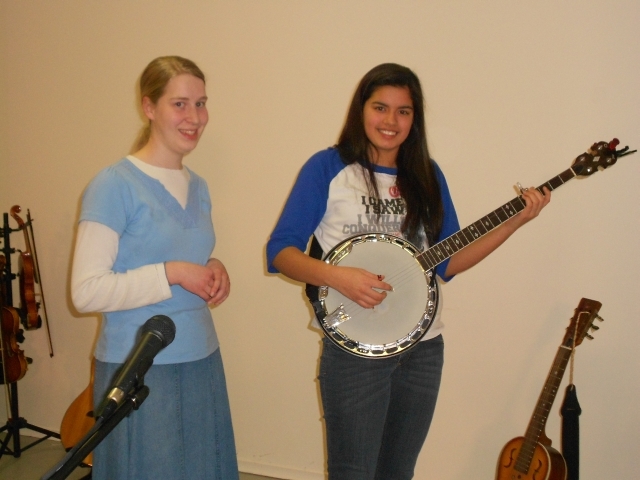 They sing songs and hear the Word of God from Mr. Rassmussen. It’s a wonderful ministry and one to keep in your prayers. 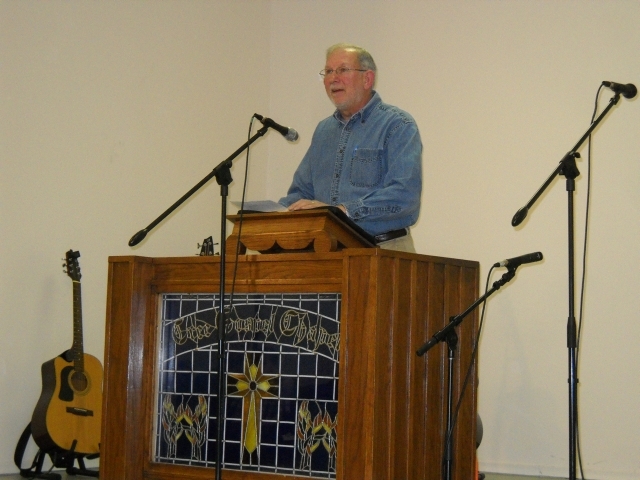 The workers conference was held at Friendship Baptist Church. It began on Thursday evening and continued Friday morning and evening and Saturday morning. Mr. Stolhammer shared wonderful messages from the Word of God. 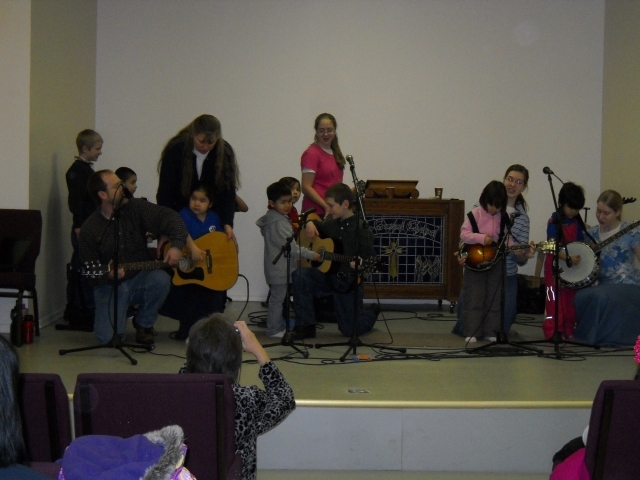 At each session our family sang a few songs, and we enjoyed being able to participate with musicians from the church as Dad led in some congregational singing. The whole conference was such a blessing—hearing the Word of God preached, fellowshipping with other believers, and praising the Lord in song, especially as a whole congregation. 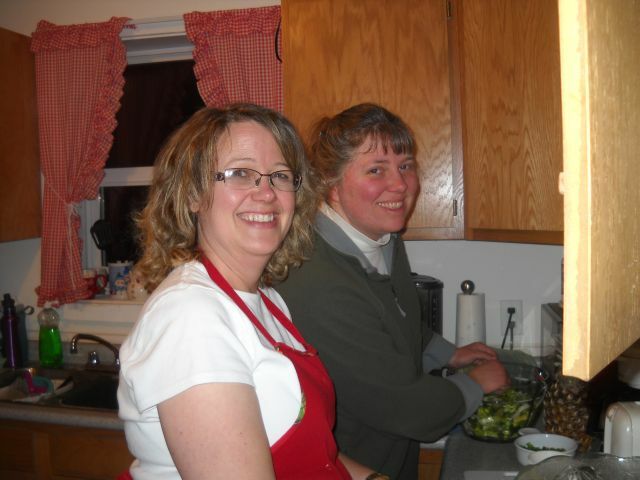 The amazing moms cooked so many wonderful meals! Friday afternoon we went skating. 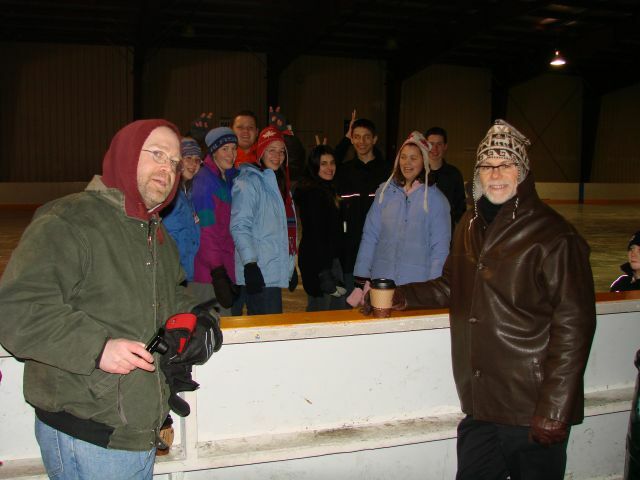 We “southerners” had to get used to being on skates again. For some of us, it was pretty much a first! Saturday afternoon we had fun snowmobiling. Sunday morning…well, that’s almost a whole ‘nother story in itself. In a good way. 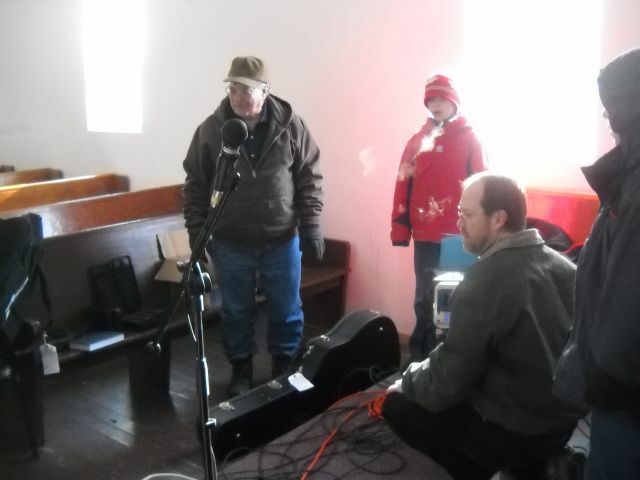 We were asked to sing a few songs for the Sunday morning meeting at “the red-roof church” on the Mishkeegogamang Reserve (or “Mish” for short). We knew there was no indoor plumbing, only an old outhouse, and we had heard something about someone normally starting a fire in the stove. 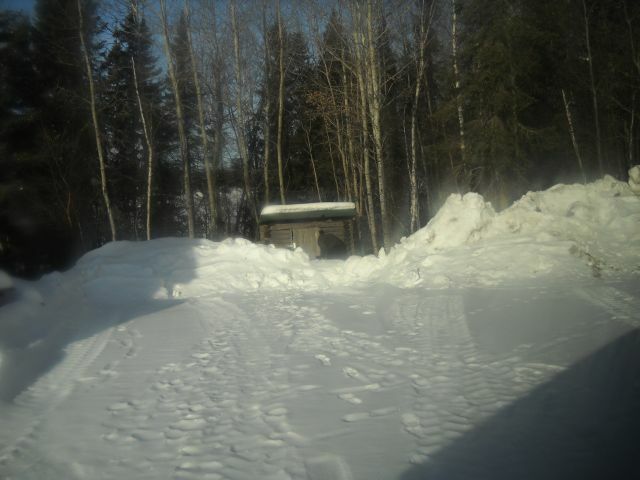 After waiting outside the church for a while for someone to unlock it, Dad decided to blaze a trail through the snow, if necessary, and take a look at the outhouse—for curiosity’s sake. 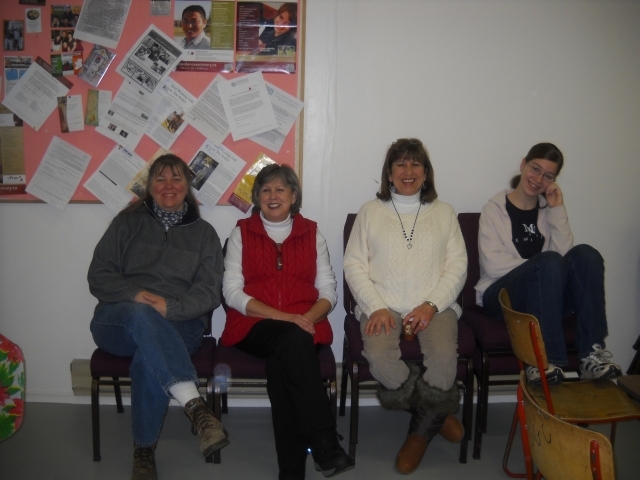 When the church was unlocked and we went inside, little did we expect it to be colder inside than it was outside!! (We were later told that sometimes they open the windows—in the winter—to warm the church up!) It was well below freezing, so no one took their jacket off. Someone got a fire going in the stove, and some church-goers began to gather around it…the best seats were in the back by the heat! People poured coffee to warm themselves and their hands. It was a long time before we could talk without seeing our frozen breath! Eventually the cozy warmth of the fire warmed things up enough to not feel so in need of a heavy jacket. Setting up the sounds system…notice the frozen breath! 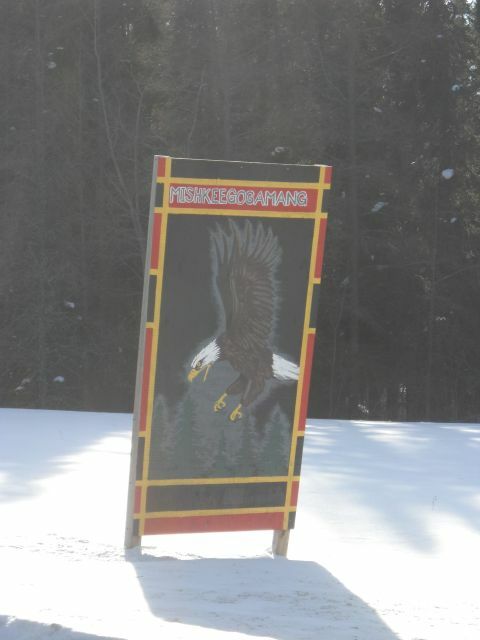 It was a blessing to be able to minister on this reserve. We have never experienced anything quite like that before. 🙂 Apparently the church building is usually warmer when people start arriving…but I don’t think we would have changed it. 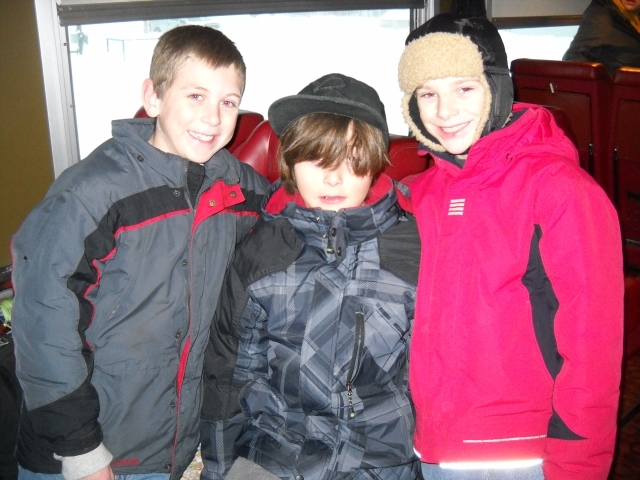 The extreme cold added to the adventure! Sunday night was such an incredible joy to us as we gathered at Friendship Baptist Church to worship the Lord and hear the Word of God with others. Some we had gotten to know throughout the week and some we hadn’t, but we all have one thing in common: Christ Jesus our Savior. 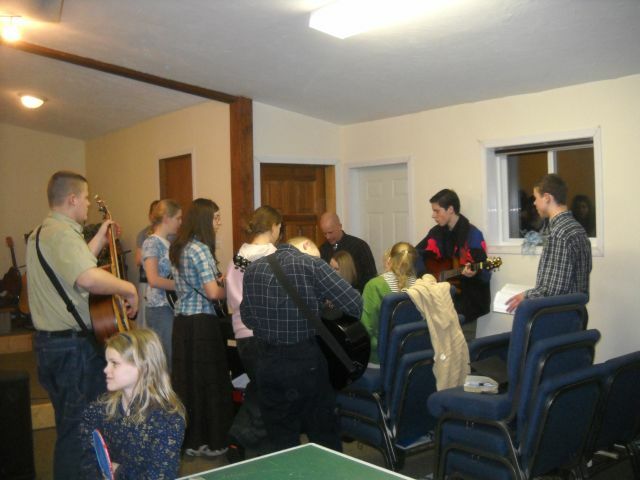 Our family sang a few songs, and at the end of the service many of the people who attend the church got up and sang for us a song called “I Have Been Blessed.” It was such a moving time—these people were family, and they were singing with all their hearts about the many ways God has blessed us. We truly were the ones who were blessed. Afterwards, some of us gathered around the piano and sang lots more. 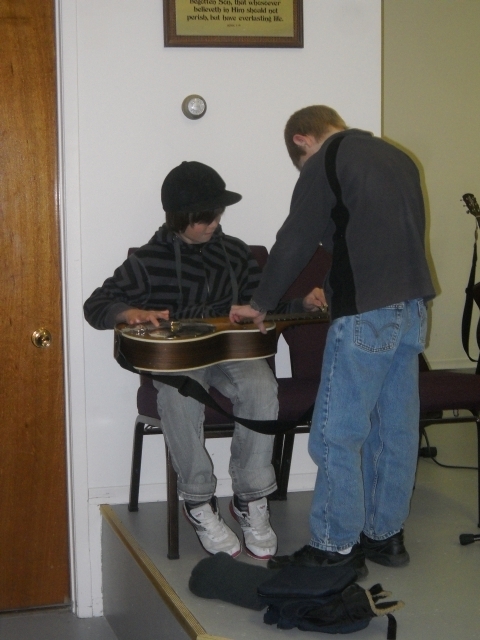 What an encouraging time we had that night! It was hard to say goodbye. Monday morning (the 13th) we had a wonderful homemade breakfast, and then began our goodbyes with the Rassmussens and Criscos (the pastor of Friendship Baptist and his wife). Both of these families have been an immense blessing and encouragement to us. When we arrived at Beaver Lake to pick up the pickup, we just had to visit some more. And snap a few pictures. Being here brought back so many good memories of last summer! We would have loved to stay longer, but we had to keep going. 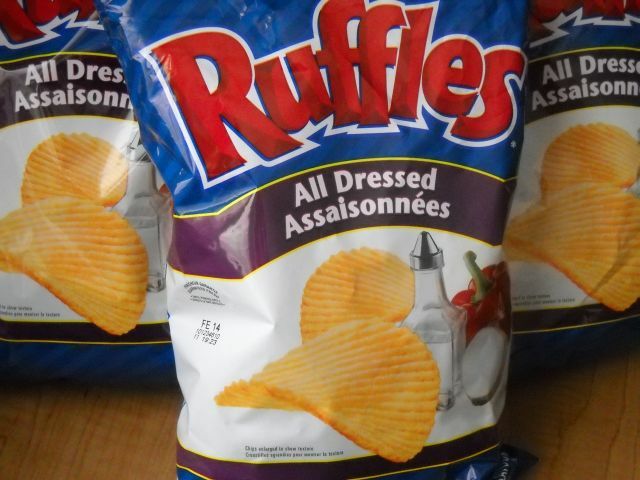 We had to stop at Walmart to buy our favorite chips: All Dressed—only available in Canada (as far as we know). How long will six bags last…? Having left Dryden, we continued down the long barren road for many miles. 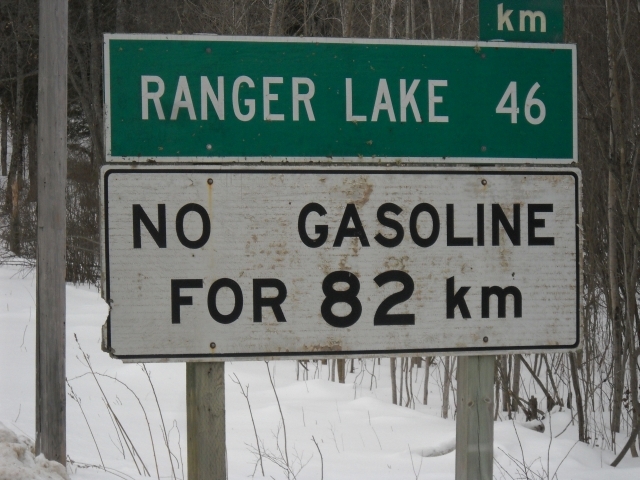 (I mean, kilometers.) Suddenly, out of the woods, a moose ran across the road in front of our van! If we had been driving there just a few seconds sooner, we probably would have collided. 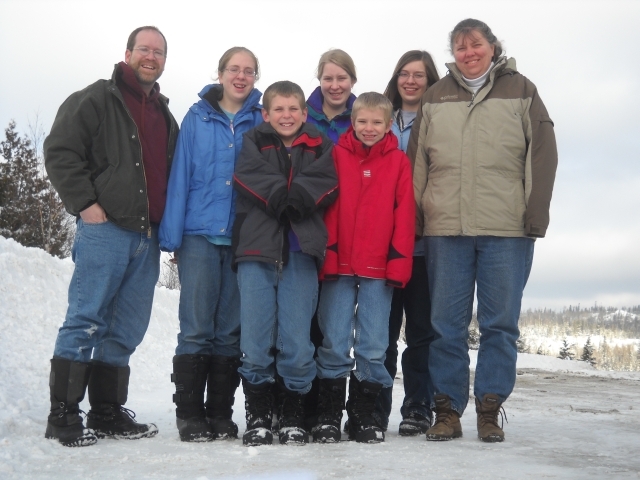 How exciting–God protected us and we got to see a moose close-up! God blessed us with an amazing time throughout the whole trip. Thank you to everyone who was praying for us. We truly appreciate it. 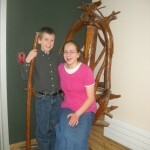 This entry was posted in ministry, serving on 02/24/2012 by Deborah. No, it’s not a factory where moose are made. 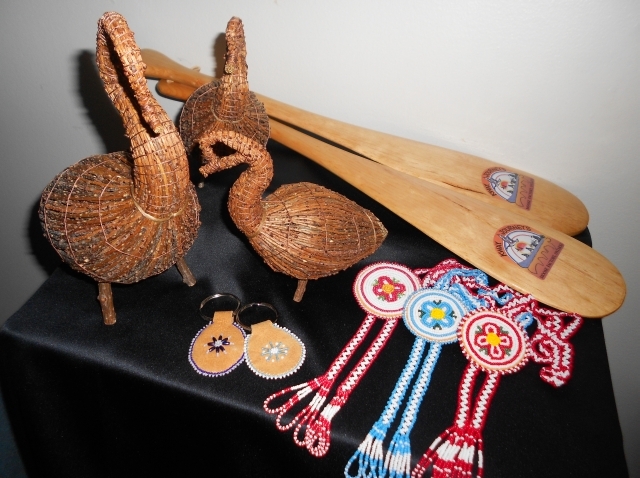 It’s a First Nations community located on an island in the Moose River in northern Ontario. It’s really amazing to see how this trip came about. 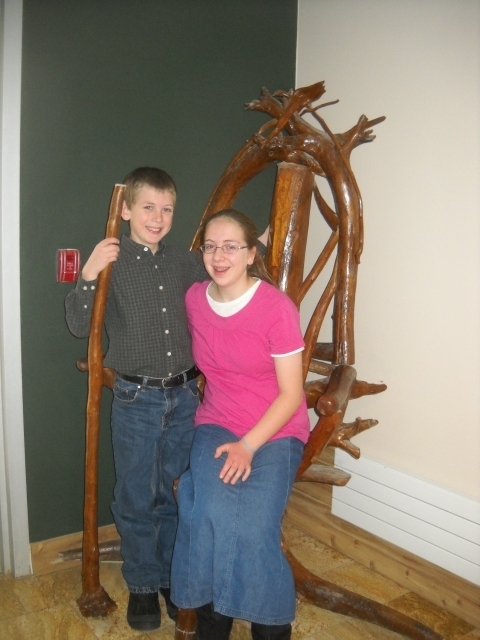 This Fall we attended Family Fall Retreat at Storybook Lodge Christian Camp. 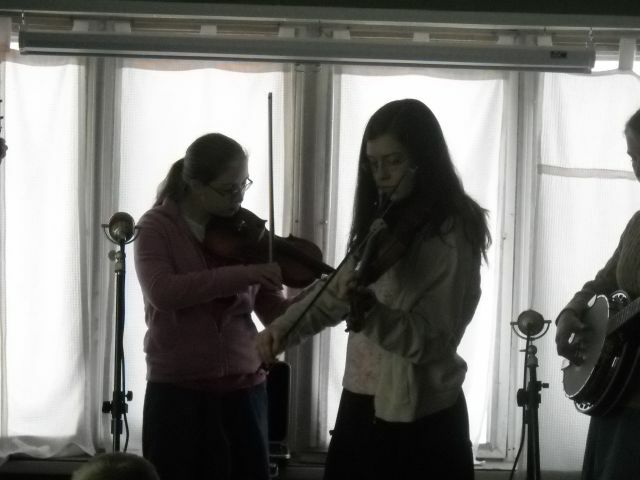 As has been the tradition for the last couple of years, we played some songs during chapel time. 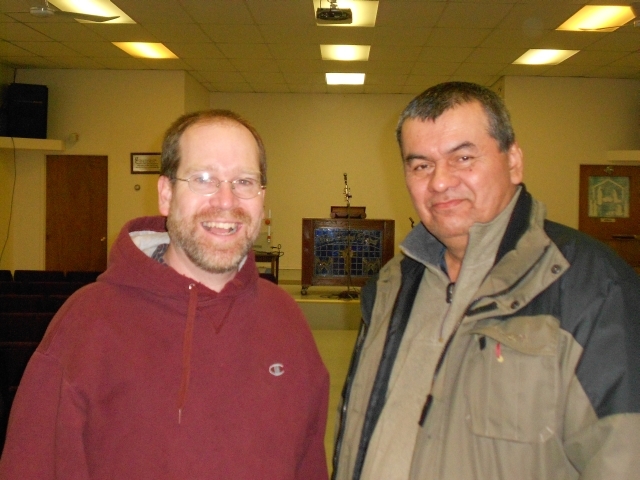 The speaker that weekend was Mr. Joe Reese from Sault Ste. 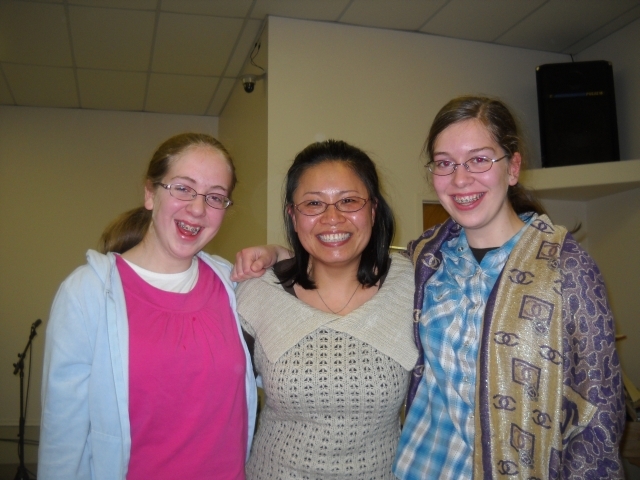 Marie, Ontario, who had been invited to preach at some gospel meetings up in Moose Factory, ON in January. 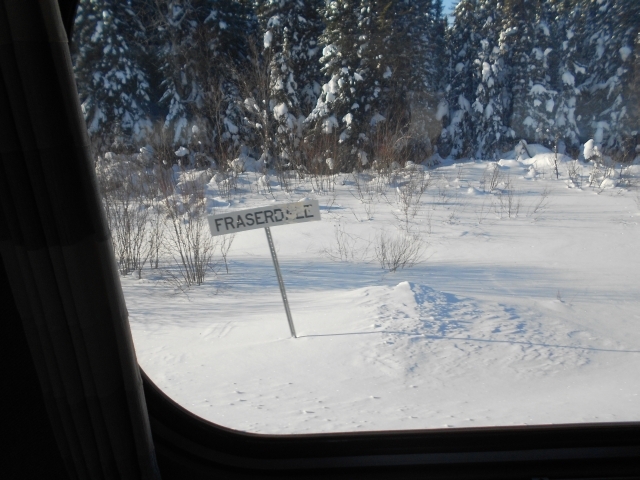 Mr. Reese asked if we had ever heard of Moose Factory and if we would be interested in joining him. 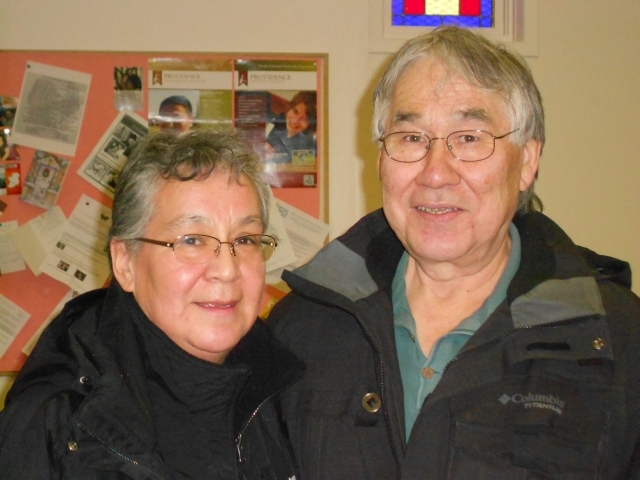 (In fact, we have heard of Moose Factory and know some people from there… including our good friend and board member for Without Reservation, James Moses, who is now with the Lord.) Mr. Reese contacted the man in charge of the meetings to see if they would be interested in having us join him and provide the music ministry for the meetings. 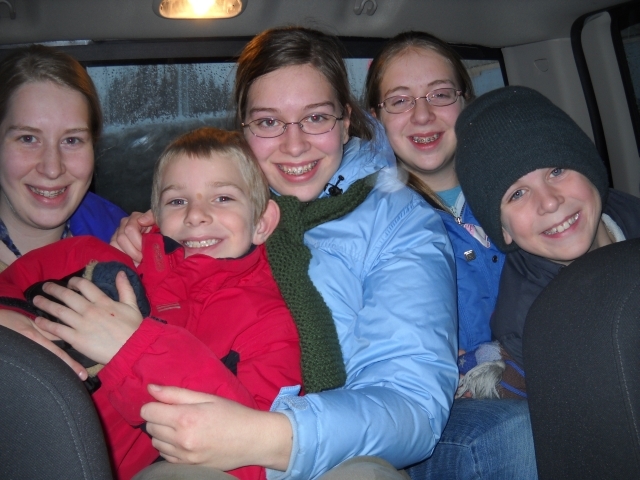 The Lord opened up the doors for the trip to happen and before we knew it, we were headed up north for another family ministry adventure. 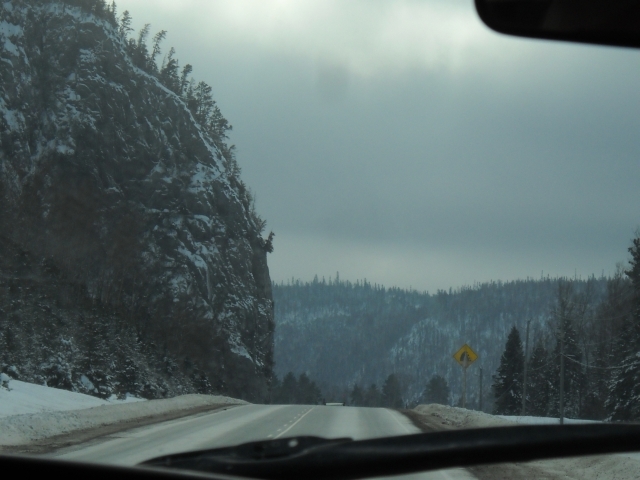 On Monday, January 16th, we pulled out around 5:30am for our 12 hour drive to Sault Ste. Marie where we would be meeting up with Mr. Reese. We enjoyed a delicious supper at the Reese’s home where we met Mr. Reese’s wife, Ann, and his two sisters, Donna and Anne, from Mississippi who would be our traveling companions for the rest of the trip up north. Another lady from the Reese’s church, June, also came along on the trip making us a group of 12. Little did we know what a joy being with these folks would be. 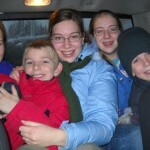 The next day we left for Cochrane, ON—an 8 hour drive from Sault Ste. Marie. We traveled on a “back road” through Ranger Lake. It was a beautiful ride. We were out in the middle of nowhere! 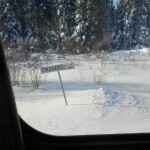 We got up early the next morning for the last big leg of our journey north… a 5 hour train ride to Moosonee, ON. We repacked bags for the train trip and headed over to the station at 8:00am to check in our 23 bags of luggage, including our 10 instruments. 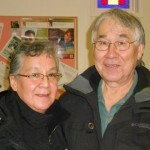 When we arrived in Moosonee, Allan and Lorraine Jolly, along with their son Mike met us with three pickups to haul all 12 of us and our luggage across the river to the beautiful Cree Village EcoLodge in Moose Factory where we would be staying for the rest of the week. 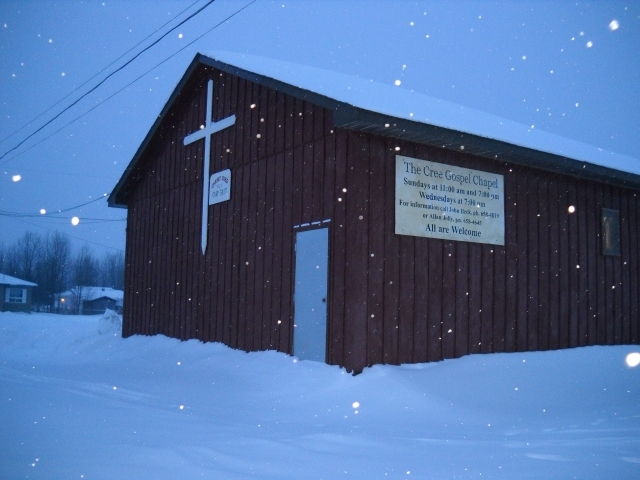 After we were settled, we hurried off to the Cree Gospel Chapel to eat supper provided by ladies in the church and set up the instruments for the first meeting that evening at 7:00. 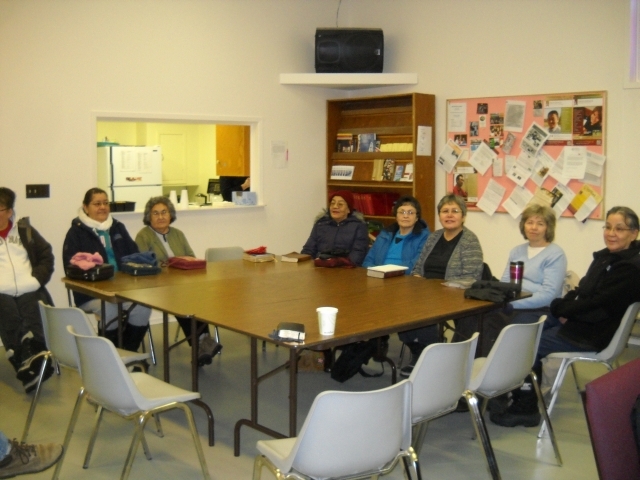 On both Thursday and Friday there were ladies meetings led by Mrs. Reese in the morning that were such a privilege to be a part of. On Thursday, we simply had a time of sharing testimonies and it was such a blessing and encouragement to hear how the Lord worked to bring each of us to Himself. 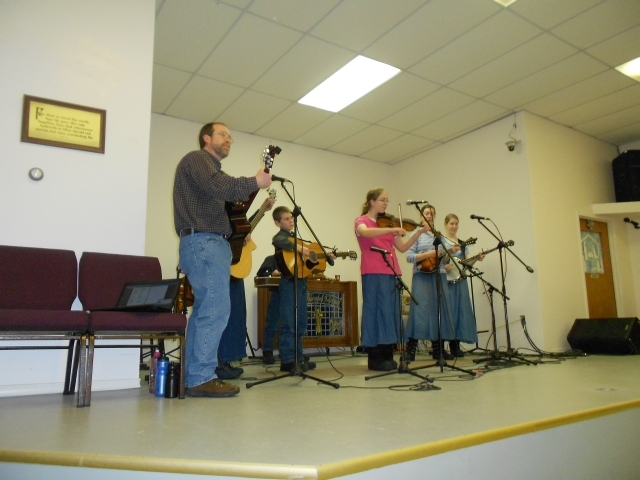 Every evening, from Wednesday to Sunday, our family was able to minister through music during the meetings. 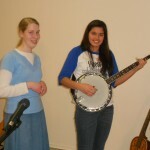 We sang about 5 songs each night, followed by powerful preaching of the Gospel. 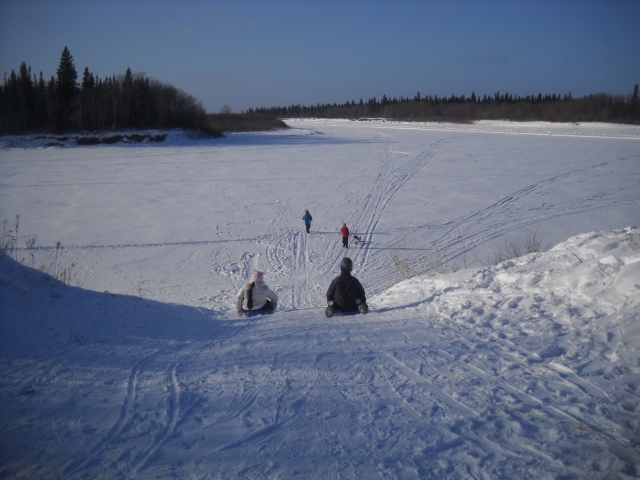 The meetings were being broadcast on the local TV channel that airs in Moose Factory and Moosonee. 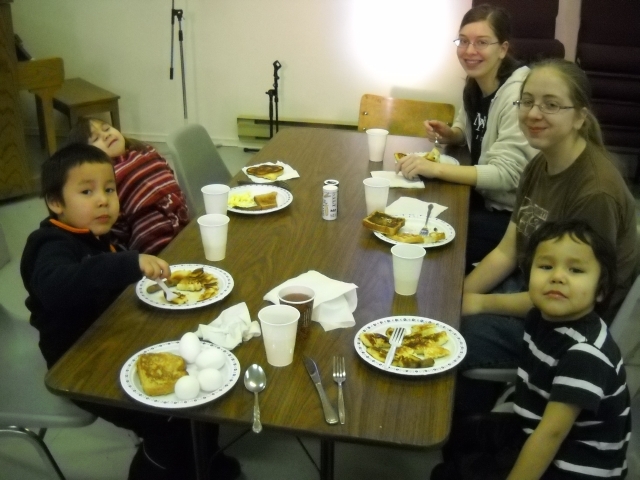 On Saturday morning, the church hosted a brunch. 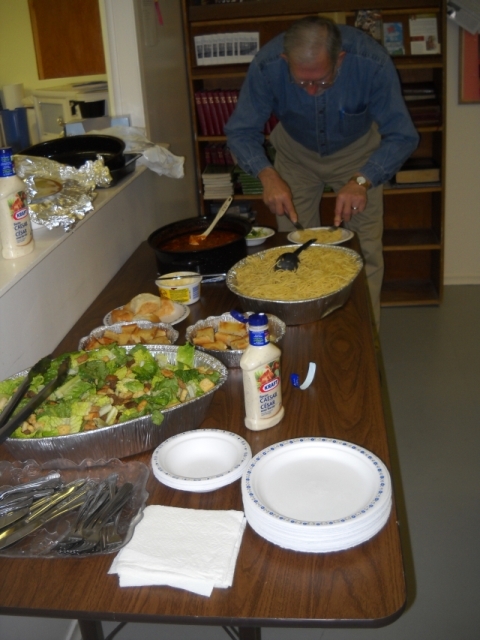 Lots of people came bringing dishes of yummy food! 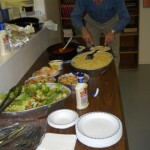 Mr. Reese shared a devotion that morning, and we all enjoyed the wonderful food and fellowship. Dad shared on the local radio station for Sunday morning. 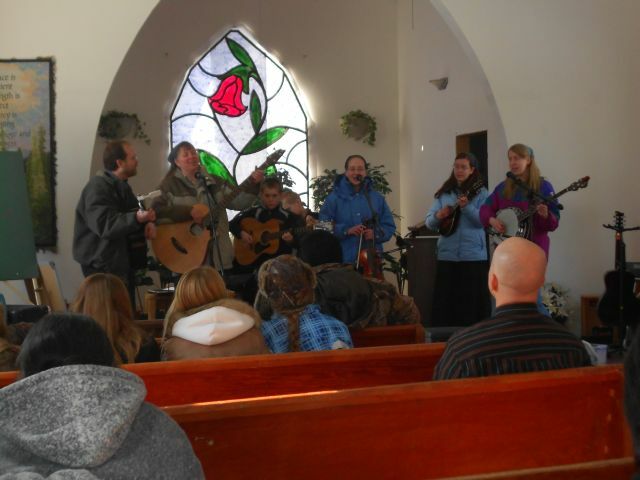 The family was also asked to lead the music during the Sunday morning service and so we pulled out some hymns as well as some of our old Sunday School songs we learned at St James Gospel Chapel while living in Winnipeg. 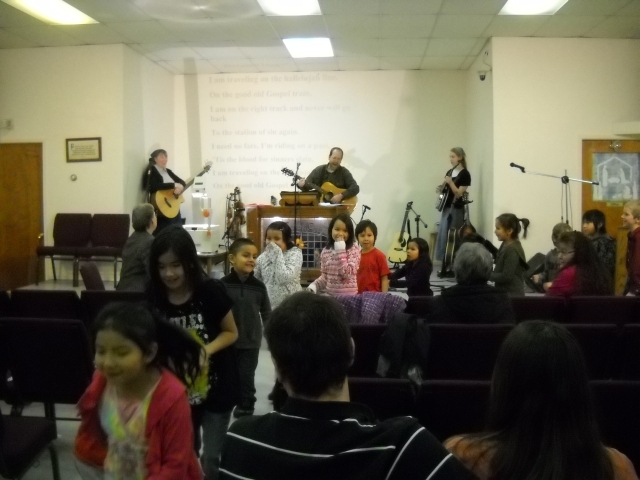 The kids loved “The Gospel Train” song as they were the “train” walking around the chairs. The good old Gospel Train... Whoo-whoooo! Dad and the girls were also given the opportunity to teach Sunday School because some of the teachers weren’t able to be there. 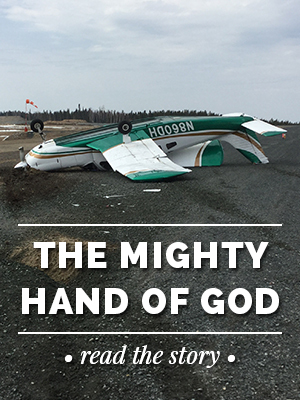 That night was the final gospel meeting and God’s Word went out once again with great power. The church surprised us by giving us beautiful gifts that were handmade by people we had met. 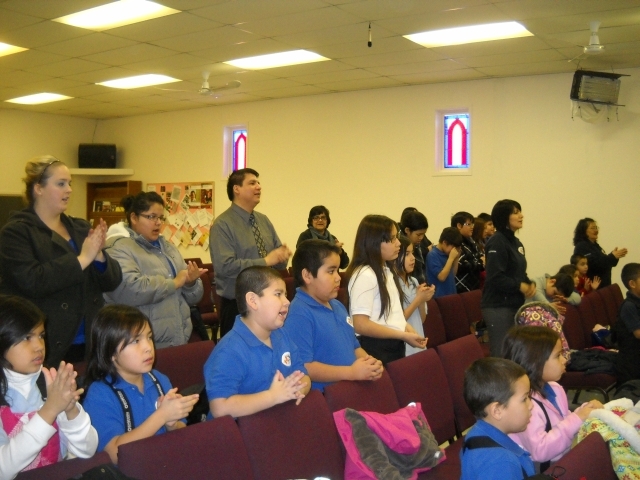 Monday was our last day in Moose Factory and that morning we sang for the Moose Factory Academy of Christian Education. It was a Christian school that uses the same curriculum that we use for home school. 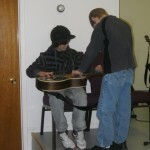 There were about 30 students and staff that came to the church for the concert. Monday was the day we packed up our gear and memories. 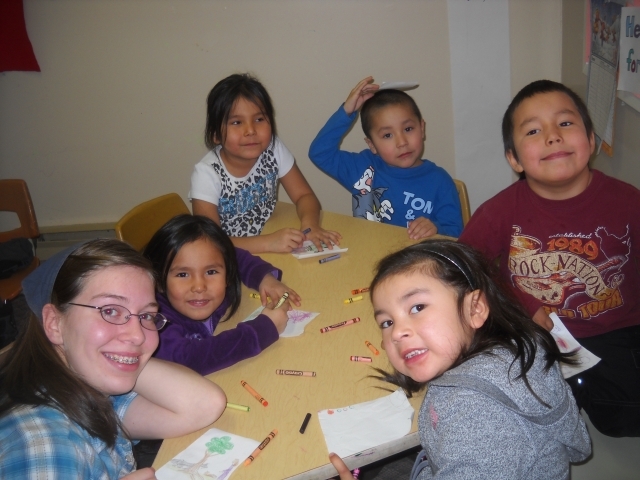 It was a great time in Moose Factory. Apart from the wonderful meetings, we were encouraged by many people. We learned how to skin out a martin caught on the trapline, enjoyed some memorable winter road tours, and had great fellowship in Christ. 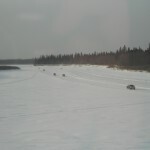 We crossed the frozen river and headed over to the Moosonee train station later that day and were delighted to have some of our new friends meet us there to say goodbye. One lady made us some delicious banana bread for our trip home and her son brought some activity books for Daniel and Jonathan. It was sad to leave our new friends behind; its amazing how the common bond of the Lord Jesus Christ can build wonderful friendships in a short amount of time. 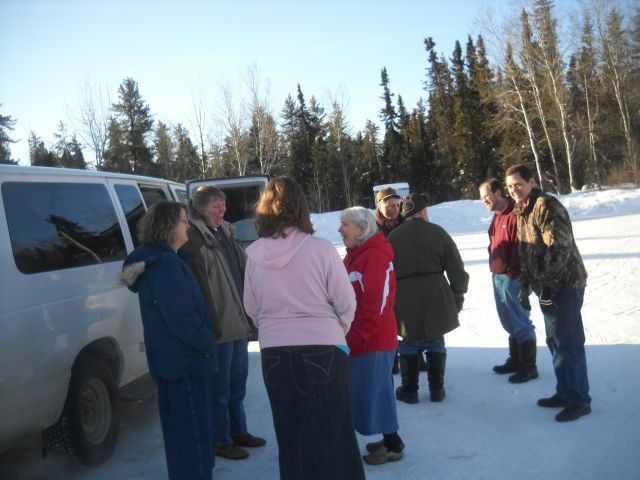 We were especially thankful for the warm friendship of Allan and Lorraine Jolly… and the warm trucks that they faithfully drove us back and forth from our hotel to the chapel in below zero weather. 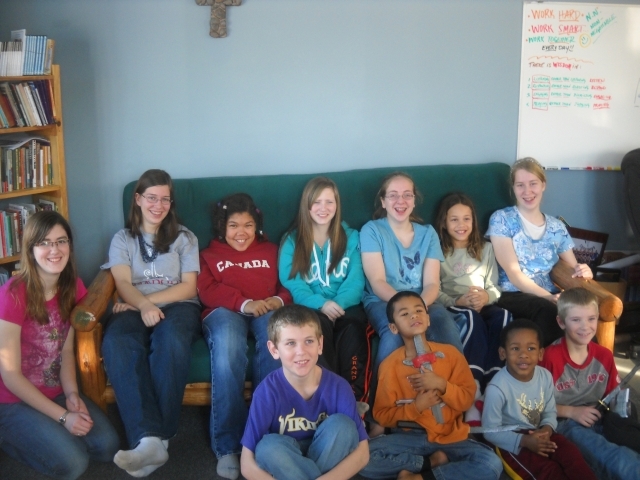 We learned so much from them about the community and way of life up there and we were blessed by their commitment to Christ. 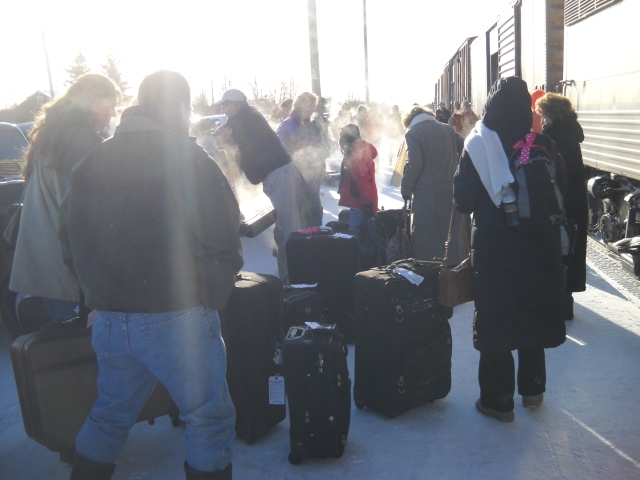 It was an icy mess when we got into the Cochrane train station around 10:00pm. We said farewell to the Reese family and June… folks that we had only met a week earlier, but now were fast friends and newly acquired grandmas. Being with these precious folks was a treat. We even got to learn how to interpret deep-south English! (Anne and Donna speak “Mississippian”.) There was no shortage of laughter during our time together. We spent the night in a motel before heading toward our last stop before home. 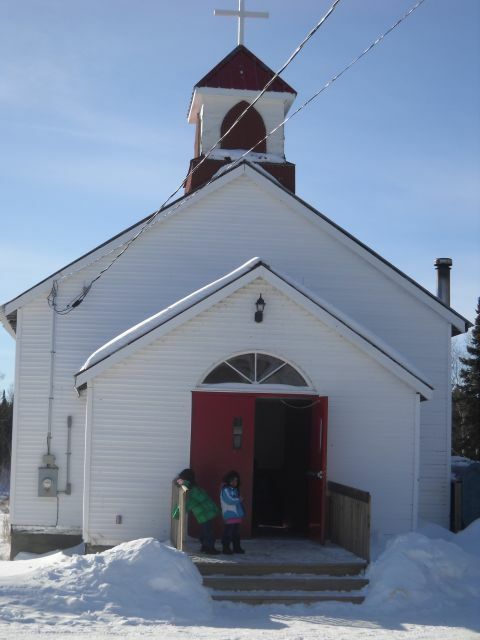 An 8 hour drive brought us to Beardmore, ON were our friends the Mikeshes are serving the Lord. We got there in time to have supper with them and some of their friends. 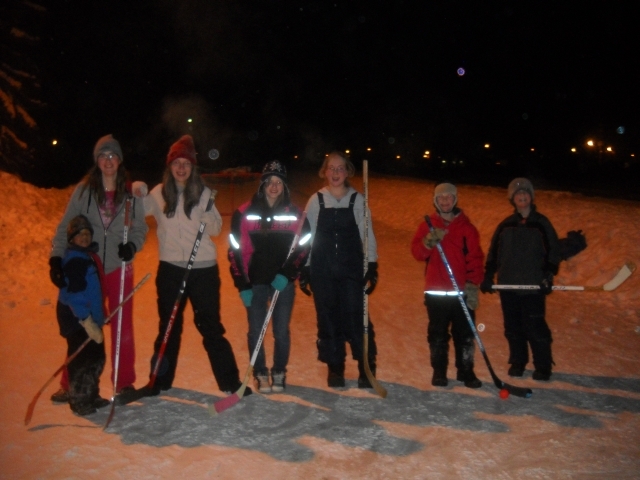 Afterwards, all the kids headed outside for a game of street hockey. 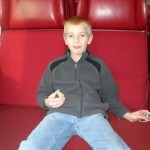 We spent a wonderful evening and full morning with their family; we didn’t leave until almost noon the next day! And we were finally on our way home. 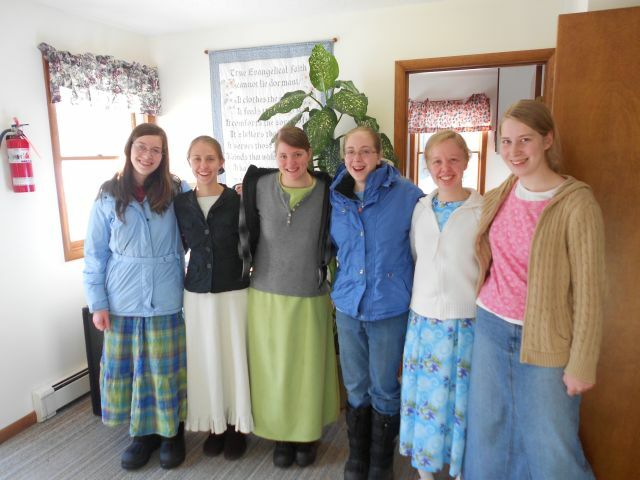 Ten days is a long time to be away from home, but it sure was a wonderful trip on which the Lord blessed us abundantly. Thanks to all who were praying for us on this trip; the Lord answered your prayers as He protected us on the snowy/icy roads and blessed our time there. Please continue to pray that the Lord would work in the hearts of those in the community who heard the gospel and that they would put their trust in Jesus Christ. 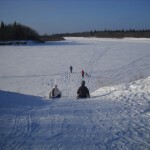 We will be heading up to Pickle Lake, ON from February 8-14 so we would appreciate your prayers for that time as well. 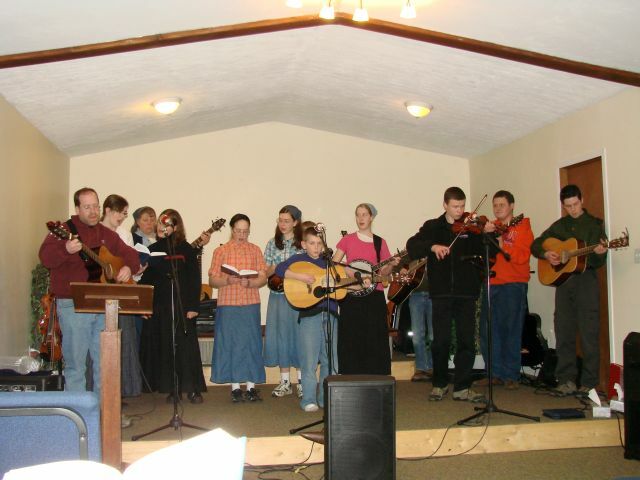 We will again be singing up there and desire for the Lord to use us for His glory as we serve Him up north. 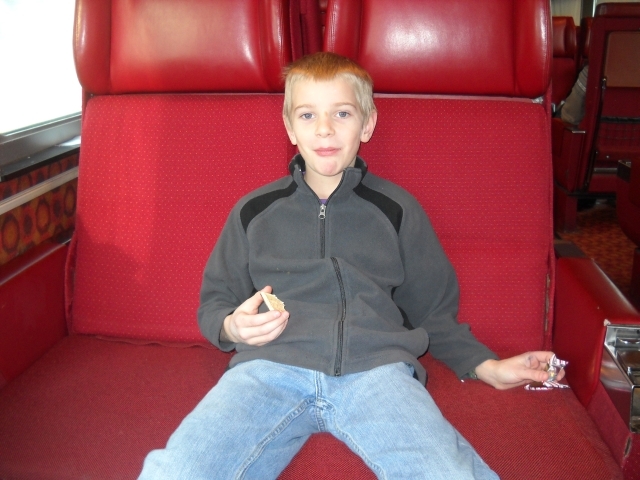 Enjoying the train ride... and a snack! 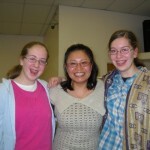 This entry was posted in ministry, serving on 02/01/2012 by Sara.